Rider Training – Are You Honestly Good Enough? Ever look at someone skilled in their art form and wondered how they became so talented? Often times, if you ask, it’s due to some serious amount of training and concentrated practice that has provided them with the skill set to set them above the crowd. Even if someone is innately better at something than others, training can outpace the natural abilities someone might think they have. Motorcycling is no different. There are good riders who far surpass our own skills, and those that frankly just scare us to death on the road. It’s a bit hard to believe that in a sport that has a little bit higher risk, since we don’t have a cage around us, that people just haven’t taken those extra steps to learn and become better. If safety isn’t a concern to you, then stop reading now as this article will bore you. I can tell you definitively, that taking a basic rider training course (I went through Pacific Riding School) created a solid foundation for my riding which, even today some 7 years later, still resonates in my head when I’m out in the urban jungle riding (Code 1!!). You speak to anyone, skilled rider or not, who has taken next level training beyond the basic rider school and they will rave about how dramatically they have advanced. This can come in a variety of formats, but I assure you that any kind of additional training and self-practicing will help you advance. Additional training can often be found in a number of different arenas and although you may not think certain ones apply to you … seriously, they ALL can help you become a better rider. 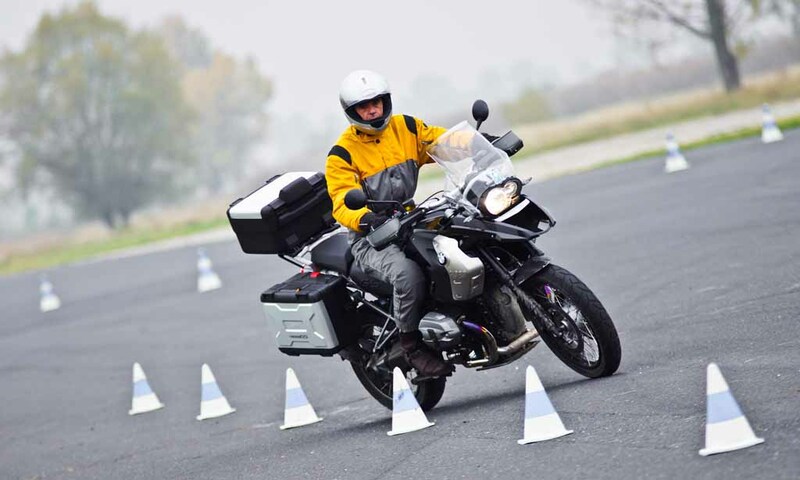 From advanced road training, to track days, to slow speed maneuvering, to off-road training, all of these styles of additional education can allow you to build an incredible toolkit and bring safety into your riding world. The crazy part about this advanced training, is you learn very quickly that the bike can EASILY do more than what you put it through. The stumbling block and what holds things up is YOU … the rider. You can find some road version advanced rider training through a number of local rider schools and some that are just outside of the lower mainland that will put you through a gauntlet of cones with repetitive practice to push YOU, beyond your typical limits and allow you to be able to more confidently respond in emergency style situations on the road. I’ve spoken to a number of the trainers and something they absolutely love about this style of training is that every attendee has their mind blown by the growth they have experienced in such a short period of time. The development is certainly visible and people always feel they got a great deal out of these courses. The interesting thing with track days is how addictive they can become! Although it might seem more dangerous, it is actually one of the safest environments you can ever ride in. Miles of open track with a very limited number of bikes on at any one time provide a safe place for people to learn about the capabilities of their motorcycles. I see people using our local highways as a place to practice trying to get their knee down as they rip way over the speed limit through corners and roads where there can be oncoming traffic and other traffic around them. One small mistake or unsafe road conditions due to cars puking oil out on the road and they can suffer thousands of dollars in damage and put themselves in life threatening situations. Why people?? Why? Track days will often come with a bit of guidance/instruction and if you want to take it to the next level, you can get one-on-one training to help you push the limits even that much further and learn some techniques on the tracks. How does this apply to real life? Well, when vehicles move erratically in front of you, or you go hot into a corner, you can push the bike beyond your normal road riding style and feel comfortable doing so as you’ve experienced it on the track. People freeze up, because they are scared. Scared because they don’t believe the bike can do it. Often, the bike can do way more than what you feel it’s capable of doing, but you don’t realize until you push it to the limits in a controlled environment and get comfortable with doing so. This one is funny. Everyone gets their motorcycle license and learns how to ride, gets out on the open roads and gives it the gas and rips around having lots of fun. Then they get into a parking lot, or need to make a turn at a stop, or maneuver at slow speed and BOOM! Down they go. Almost at zero speed, most times. HOW EMBARASSING especially on the corner of Broadway and Cambie across from the sky train station with about 80 people on the corner of the street watching you fall to the ground the crowd exclaiming OOOOHHHH because you hit the front brakes mid-turn due to a car that came ripping down the hill changing lanes and you figured it was probably smart not to go and get smoked! Totally hypothetical! This never happened, really, I swear! Slow speed on two wheels is a challenge and the only thing that makes you good at this is practice. Nobody practices this after taking their riding course and gets their license. A few years ago, we put on a slow speed development course and had people running through a series of cones doing maneuvers with their bikes and people were blown away by the advancement they had and confidence it built in a few hours of practice time. I’d like to somehow get this going again, but people can do this on their own in an empty parking lot. Does off-road training help on-road riding? I can personally tell you that some basic training in one day probably quadrupled my skillset on the road after doing some off-road training. People are often scared to do off-road training, but the reality of it is that trees don’t move, cars do. You are likely in a much safer environment in an off-road setting, it’s the terrain that is more difficult. The loose dirt/gravel scares the s*&t out of people but honestly, even with street tires you’d be surprised at how well a motorcycle can perform in those conditions. Added bonus: when you are driving down a road and there is construction and the road is all torn up or they make you drive on gravel, you aren’t scared stiff! Added bonus 2: when you are driving out in the countryside and you see somewhere you’d like to go and it’s got gravel between you and the destination, you won’t be scared to take it. You’ve just opened doors of opportunity in your riding that can give you life experiences and adventure that you’d otherwise have been scared and quite likely reluctant to do. If you stop learning, you are dead to the world. This means that just because you’ve done some training once upon a time, it simply isn’t good enough. You need to invest in your own safety and wellbeing and do some form of training annually if possible. I know a local rider who has done the California Superbike School some 8 times and states that every time has been worth way more than the cost of doing the schooling. If you want adventure and want to enjoy your riding experience that much more, don’t be cheap. Take some rider training as it will open doors and give you more joy by a thousand times the cost of the training.